Warning: This is enough for two pies. I usually freeze half so that I can make another pie later. Dice your carrots, tomatoes and onions. 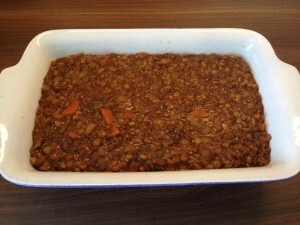 Weigh and rinse your lentils. Put the oil in the biggest pan you have (and you will need a big pan, or you’ll have to halve the ingredients) and heat on full. 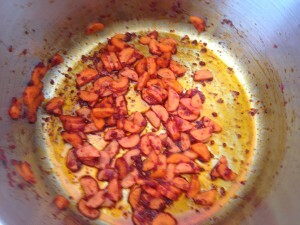 Add the tomato purée, turn the heat down to medium and fry for a minute, then add the carrots and stir. After about five to ten minutes, add the tomatoes, stir well and leave for five minutes. Then add the onions. 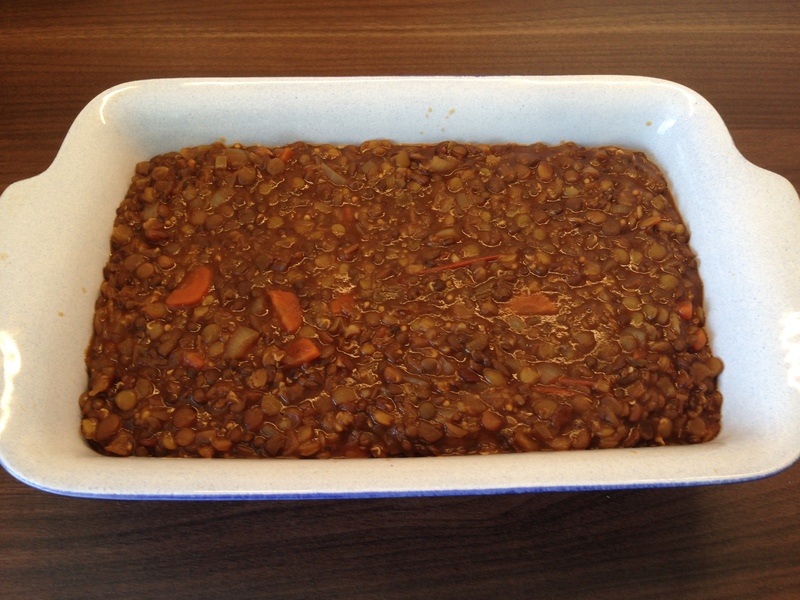 After a minute or two you can add the lentils, mustard seeds and half of the vegetable stock. 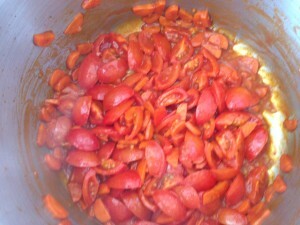 Bring to the boil and simmer for 30 minutes. Stir occasionally to make sure nothing is sticking to the bottom of the pan. 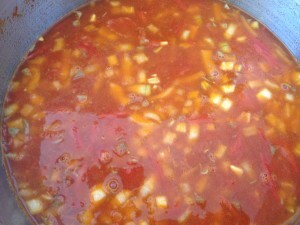 Add half of the remaining vegetable stock, the dark soy sauce and the starch, and stir well. Leave it for another 15 minutes and then check if your lentils and carrots are cooked through. If not, add more veg stock if you need it and simmer for another ten minutes. Repeat until your lentils are cooked through. Pour the potatoes into a sieve and add two generous tablespoons of margarine to the pan, and throw the potatoes back in there. Mash well. Add the milk and mash. Add the mustard and mash again. 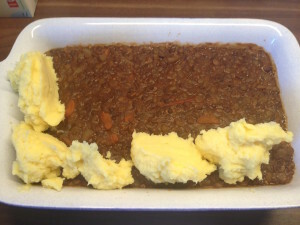 Since there’s nothing worse than lumpy mash: mash again. 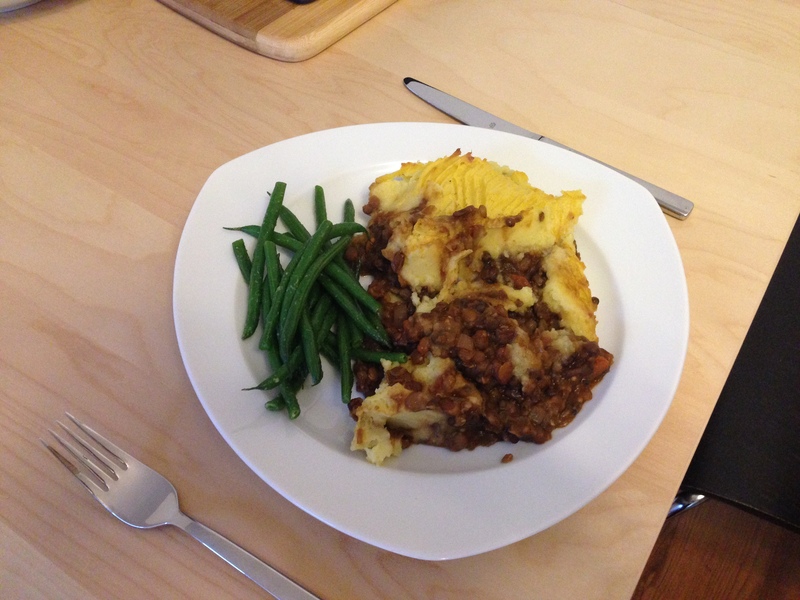 If you’re not sure it’s fluffy enough for you, you can add a touch more milk (and mash!). 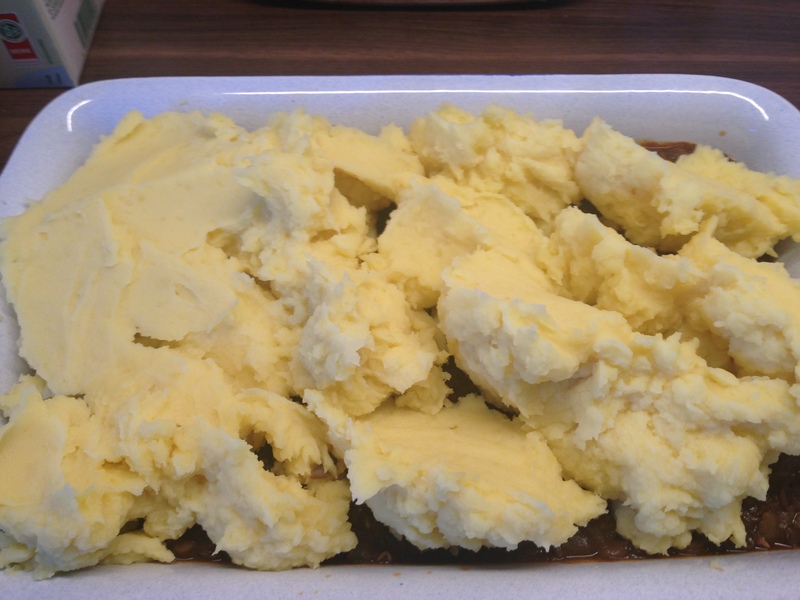 You want to make sure that the mash isn’t too stiff to spread over the filling, so I use a touch more milk than I would if I was making bangers and mash. 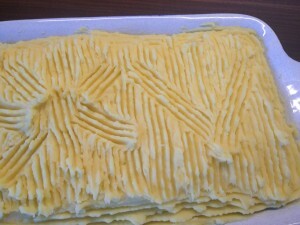 Put small spoonfuls of mash around the edges and then work your way to the middle. Spread it flat over the filling using the back of the spoon. Then put some salt and pepper on top and put it in the oven until the top is golden. 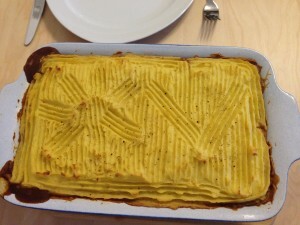 If you made your filling in the morning and your mash in the late afternoon like I just did, and they’re both cold before they go into the oven, I would put the pie in the oven for about an hour at 180. If you made it all at the same time and everything is still hot, you can either put it under the grill to get some colour on the top, or you can put it in the oven on high (210) for about 15-20 minutes. Serve with some green veg (green beans, broccoli or peas). The pie’s yours, you deserve it. Hello and welcome to my blog! 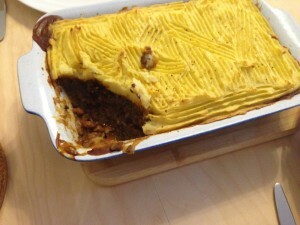 It’s all about yummy vegan recipes!